FOXG1 Gene Disorder, which is also known as Congenital Variant Rett Syndrome, is a rare neurodevelopmental disorder caused by a mutation of the FOXG1 gene, which is located in band 14q12 on the long arm of chromosome 14. There are three types of mutations in FOXG1 associated with this disorder; partial or total duplication of the gene, deletion of the gene, and less frequently, a truncation misspelling, which is a premature stop in the spelling of the gene. The severity of symptoms seems to vary among the different mutations from mild to severe. On February 15, 2004 my husband, Greg, and I welcomed our beautiful baby boy, Jacob into the world. He was five weeks early and spent two weeks in the NICU. We knew when we brought him home there would be some delays due to him being early; however, they never really resolved. At six months old Jacob’s pediatrician ordered an MRI. We then discovered that he was missing brain tissue, and would have mental and physical disabilities for the rest of his life. He cannot talk, walk, feed himself, is legally blind, has seizures and a small brain, asthma, severe reflux, and global developmental delay. He functions at about an 8-12 month level and is almost nine years old. 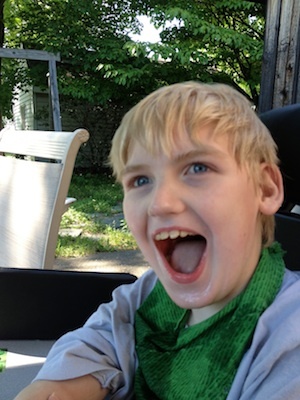 However, Jacob is the happiest kid in the world—his giggle is pure, unadulterated joy. Needless to say, it was a bit of a shock. We began to see Neurologists, Ophthalmologists, Gastroenterologists, Orthopedists, and also had Speech, Vision, Physical and Occupational Therapists coming into our house several times a week. While we were learning how to deal with all this, at 18 months old Jacob began to have seizures. His first one was three hours long. It was quite probably the most terrifying moment of our lives. We were so helpless—we didn’t know if Jacob was going to make it—and if he did, would he be different? The ER docs were amazing and stopped the seizure, finally. Thus began the first of Jacob’s many hospital stays, and yet another road-less-traveled for us. After about a year of trial and error on different meds, we finally found a med cocktail that controlled the seizures for the most part. Even so, we never knew when they would come, how severe they would be, and whether or not the emergency meds would work. More often than not we had to call 911 as the meds became less and less effective. We eventually learned to live with the “always waiting for the other shoe to drop” sensation, and tried to live our lives as typically as possible. Finally, in August 2012 we decided, along with Jacob’s Neurologist, to have a Vagal Nerve Stimulator implanted for seizure control. It’s basically like a pacemaker for the brain, and every five minutes it turns on, sending a 30 second pulse to the brain in an attempt to break up any potential seizure activity. As a result, Jacob’s seizures have definitely reduced in frequency and severity. For the first time in almost eight years, the Neurologist has begun lowering one of the three seizure meds, and between that and the implant, we are seeing some increased cognitive function. For the first time, Jacob has begun to talk. He has just started responding with the sound “ay” when his friends and family say “Hi Jacob!” It is the most amazing sound in the world! The reason I tell you all this is because while all this was going on, we were still searching for a diagnosis. We had been told previous to having our daughter that Jacob has some kind of genetic disorder, although no one could figure it out. We continued testing as the years went on, until one day we got a call: Jacob has FOXG1 Gene Disorder. We poured the Internet for more information no avail—we had a name, but the genetic mutation was only just discovered, and no information on signs, symptoms and treatments were available. I formed a support group on another web site, and eventually a few more moms joined. One of those moms, Stefanie (our Secretary) started a group on Facebook, and the rest, as they say, is history! Over the past year, we have found 61 other children diagnosed with FOXG1 in the world, but there is still very little information available. If you suspect that your child may have a mutation in FOXG1, ask your pediatrician, neurologist, or geneticist for a CGH microarray. This is a genetics test that checks the DNA for mutations like deletions, duplications, and truncations. Your child will have a vial of blood drawn, and results should be in within weeks. Other types of mutations in FOXG1, such as misspellings within the gene, will not be detected by CGH microarray. Sequencing (or spelling out the entire gene from beginning to end) must be done to make the diagnosis in these cases. As mentioned above, the symptoms may vary greatly from person to person. The majority of people with deletions, duplications or misspellings of FOXG1 have partial or complete agenesis (absence) of the corpus callosum, the portion of the brain that allows the two halves to communicate with each other. Most diagnosed individuals also have seizures, although the ways in which they manifest are diverse. Infantile spasms have been more commonly reported in children with duplications of FOXG1, while complex partial, absence, partial absence, gelastic, tonic clonic, myoclonic, tonic spasms, grand mal, and focal point seizures have all been reported in other types of FOXG1 abnormalities. If you suspect this condition may apply to your child, talk to your pediatrician, neurologist, or geneticist about the signs and symptoms and the possibility of testing. There is no current treatment or cure for FOXG1 Gene Disorder. However, there are medications and therapies available to treat many of the symptoms associated with the disorder. Such medications include those to treat reflux and seizures. Physical, occupational, speech, and vision therapy also help with the developmental delays. Many people see several different specialists, including neurologists, gastroenterologists, ophthalmologists, epileptologists, nutritionists, physiatrists, and orthopedists in addition to their primary care physician. After diagnosis, it is beneficial to consult with a neurologist if the individual is not already seeing one, as seizures often present with all of the mutations. Some families have found that having a team of physicians in one hospital system can make things much easier, as they all have access to the same medical records and can coordinate treatments among their specialties. It is important to develop a good working relationship with these doctors and therapists. Additionally, the school system and their therapists can play a key role should the individual be of school age. Having a large support system in place will ease some of the stressors on the family and provide more consistency for the person affected by the FOXG1 mutation. Also, explore your state or country’s Early Intervention and Medicaid Waivers to help with the costs associated with medical care. You can like our Facebook Page for news and updates from the Foundation, or follow us on Twitter. We also have a Facebook Support Group for diagnosed families. Please note this is a closed group intended only for family members of an individual diagnosed with FOXG1 related disorders. This way we have a private environment where we can discuss some very sensitive issues. If you’d like to join the private FOXG1 Support Group, please contact Jennifer Rittenberry, our Family Outreach Coordinator at jennifer.rittenberry@FOXG1.com. 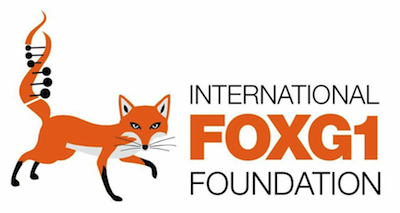 Heather Norwood is one of the six board members of the International FOXG1 Foundation. She and her husband, Greg, are the parents of Jacob, 9, and Anna, 5. Jacob is in 4th grade; he loves music, books and water, and happens to have the FOXG1 mutation. Anna just started Kindergarten; she loves unicorns, rainbows, and mud puddles. Heather works part time days for a hospital system doing Insurance Verification and appealing denials. She and the board members run IFF in the evenings over Skype and Facebook. Greg works full time second shift as a Team Leader for a company that produces plastics and also is very active within the Foundation. The Norwoods live in Massachusetts with their three pets; a dog, Bailey, cat, Patches, and cockatiel, Bubbles. Life is always interesting in their household, but they make it work with love, laughter and lots of sarcasm!